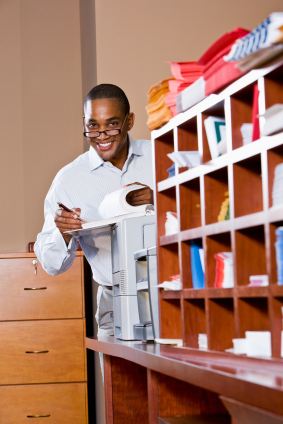 We can run your mail room from desk to delivery, sorting, and running postal mail. One call does it all. Save money. Save time covering the mailroom when your employees are out sick, hurt or on vacation…Let MDCS staff your mailroom. We will handle all your mailroom requirements. We will receive incoming postal mail, sort it and deliver it desk to desk or department to department. We will receive and log in overnight packages from UPS and FEDEX or other freight carriers. Distribute packages from building to building or desk to desk. "We will create and provide timely routine intra office runs of mail and products, this includes the distribution of time sensitive documents, mail and packages." Our staff is trained to handle special mailing and copying requirements. We will process all outgoing postal mail requirements includes first class mail and accountable mail. We will prepare and process all LTL shipments. All mailroom management services will be specifically tailored and designed to fulfill your mailroom and shipping needs. Whether you need a mailroom staff of twenty or one person to come in for a few hours each day, please contact Mail Delevery & Courier Service today. We work with mailrooms throughout Connecticut from Stamford, Bridgeport, Fairfield and New Haven to Hartford, Waterbury and Norwalk. Contact us today to find out the specific ways in which we can help your company's mailroom transactions run more smoothly.